Platelet Rich Plasma (PRP) Therapy is a non-surgical treatment used to enhance hair growth. By taking advantage of the body’s natural healing abilities, PRP is becoming one of the most popular options for hair growth. PRP is created from your own blood; first blood is drawn from your arm, the sample is then processed in an FDA-cleared device to separate the platelets and plasma from other components like red blood cells. The platelets are painlessly injected into the scalp under a local anesthetic, resulting in a slow in hair loss and the growth of thicker hair. Since PRP therapy is non-invasive, there is no downtime. Results can be seen as early as 3-4 months, and the process can be repeated as often as twice a year. 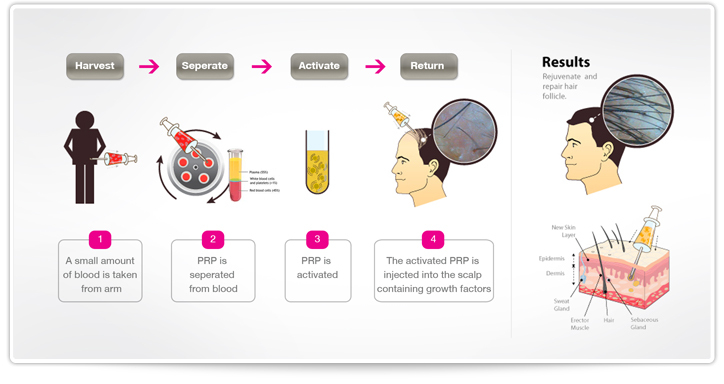 PRP can be used as a stand-alone treatment or to improve the recovery and results of hair transplant surgery. To learn if you are a good candidate for PRP with Dr. Bazell contact us today to schedule an appointment. You can also contact us directly at 847-382-4160 !